The faculty and staff of Cheraw High School have a new motto for the 2018-2019 school year: ASPIRE. ASPIRE represents the many changes occurring to help students continue to be lifelong learners after high school. To ensure our students are college and/or career ready, Cheraw High School is partnering with the Francis Marion Center of Excellence for College and Career Readiness for professional development. 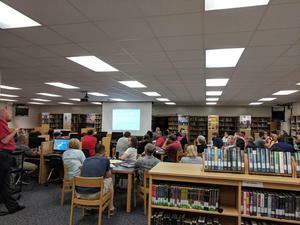 Teachers began with a summer book study of “College, Careers, and the Common Core” by David Conley and then participated in a workshop led by Dr. Meredith Love and Dr. Matthew Nelson of FMU. 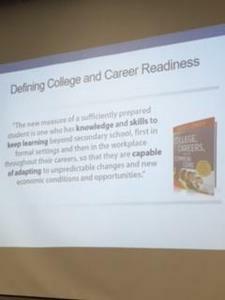 In the workshop, teachers collaborated on creating a college-going culture and ways to better prepare students for the rigors of college-level work. In addition to these efforts, CHS has piloted an Accelerated Dual Credit program with NETC for the Class of 2022. The Braves in Business program, which began on last year, will be expanded to assist more students with the career readiness skills needed to increase their employability. Throughout the year, FMU will continue facilitating professional development for the CHS teachers.